Notorious for being provocative both on- and off-stage and leading a foundation committed to empowering young people, Lady Gaga personifies the very #BornToDare spirit that TUDOR has lived by since its creation. Her latest mega-project is a two-year residency in Las Vegas with back-to-back different shows in 24 hours. An astounding voice, style icon, award-winning actress, political activist and philanthropist – Lady Gaga is all of these and much more. With her unique style and charisma, Gaga keeps millions of fans and the fashion community enthralled by her theatrical approach to her art. An Academy Award nominee, as well as the holder of six Grammy Awards, two Golden Globes and two MTV awards, Lady Gaga has achieved a level of fame and respect few entertainers ever have. She has sold 150 million singles and over 30 million albums and is the only female artist to have had five US number one albums in the second decade of the 2000s. This incredible achievement is a result of her unique recipe for success: raw talent, hard work, bold choices and immense gratitude to her fans, her “little monsters” as she calls them. When you try and think of a daring individual in today’s popular culture, it is difficult to find anyone more fitting of the description than Lady Gaga. Behind the glitter and glam, her provocative style and political statements, she is the quintessential artiste. A singer, composer, performer and dancer, she uniquely projects herself, creating a revolutionary image as a way to reach her public. Writing her own lyrics, playing the guitar, the piano, dancing, asserting her unconventionality, she inspires awe, raises awareness and demands attention. The latest audacious project from Lady Gaga is a two-year residency in Las Vegas at the Park Theater. Not content with a regular show, Gaga has devised two contrasting events that will co-exist across two nights. The first is a unique staging of her pop hits, performed through a multi-art form extravaganza featuring live music, theatre and epic visuals entitled Lady Gaga Enigma. The second show is a more intimate affair featuring stripped-back versions of her songs. These simpler shows are called Jazz and Piano and will give the spectators a chance to see her hits performed in two completely different contexts and interpretations; all within the space of 24 hours! Lady Gaga is not just about entertainment and show business; she also tackles significant political and social issues. As a committed activist, her messages take many shapes and forms, often going against the political tide, but always without fear. Raising awareness of and money for Haiti in 2010 and Japan in 2011 were key achievements. She is an advocate for the rights of the LGBT community and she is certainly not poker faced about her religious beliefs. Her Born This Way foundation is committed to supporting the wellbeing of young people and empowering them to create a kinder and braver world. Leveraging rigorous academic research and authentic, meaningful partnerships, it provides them with tolerant communities, improved mental health resources, and more positive environments – online and offline. Lady Gaga is a global fashion icon – mindful of everything she wears. She has turned celebrity into a comprehensive art form. She intrinsically understands that each outfit conveys a powerful message and can be an art performance in its own right, where each and every accessory is key to the look. In keeping with this always audacious attention to detail, Lady Gaga might wear three or four watches on one wrist, like she did on the cover of ELLE USA last Fall. When she wears (only) one watch, she might go for the sporty Black Bay 32, TUDOR’s most famous historical design, or Clair de Rose, a delicate women’s watch that is both timeless and elegant. The TUDOR signature is #BornToDare. It reflects both the history of the brand and what it stands for today. It tells the adventures of individuals, usually anonymous, who have achieved the extraordinary on land, on ice, in the air or underwater, with a TUDOR watch on their wrists. It also refers to the vision of Hans Wilsdorf, the founder of TUDOR, who manufactured TUDOR watches to withstand the most extreme conditions, watches made for the most daring lifestyles. Finally, it is testimony to TUDOR’s pioneering approach to watchmaking, which has helped to make it what it is today. At the cutting edge of the watchmaking industry, the brand’s innovations are now essential benchmarks. The TUDOR #BornToDare spirit is supported globally by high-profile ambassadors, whose life achievements directly result from a daring approach to life. 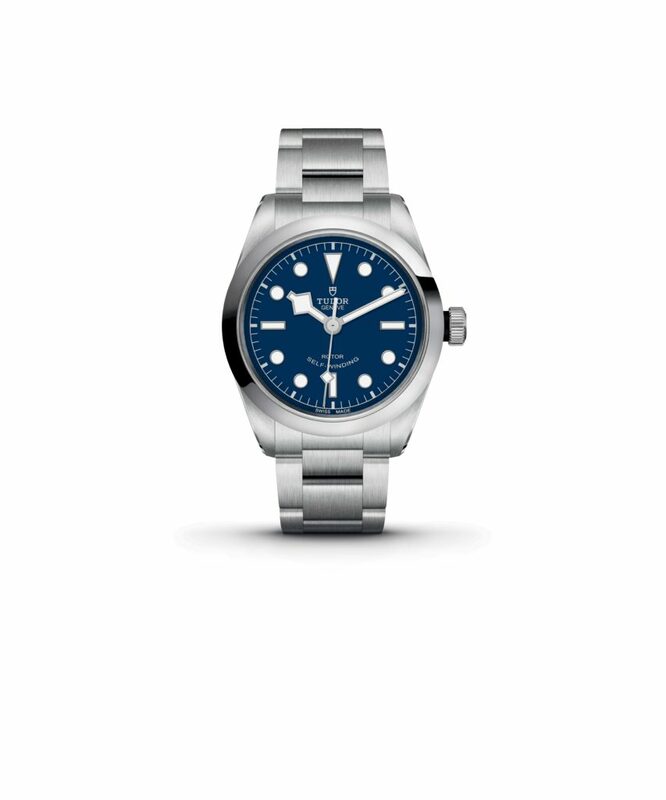 TUDOR is a Swiss-made watch brand, offering mechanical watches with sophisticated style, superior quality and unique value for money. The origins of the TUDOR brand date back to 1926, when ‘The TUDOR’ was first registered on behalf of the founder of Rolex, Hans Wilsdorf. He created the Montres TUDOR SA Company in 1946 to offer watches with the quality and dependability of a Rolex, at a more accessible price point. Over the course of history, TUDOR watches became the choice of daring individuals worldwide on land, ice, in the air and underwater. Today, the TUDOR collection includes flagship models such as Black Bay, Glamour and Clair de Rose. Since 2015, TUDOR offers mechanical Manufacture calibres.